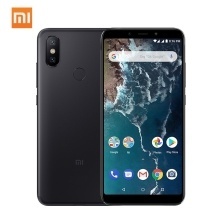 The Xiaomi A2 features a 5.99-inch display with FHD+ of resolution and Corning Gorilla Glass 5 for high protection, and powered by a Snapdragon 660 octa-core processor coupled with 3GB/4GB of RAM and 64GB/128GB of internal storage, it offers premium performance with a lighting speed. Comes with 20MP + 12MP AI dual camera on the rear and 20MP front-facing camera with advanced shooting modes for delivering your unique beauty. Android One – latest innovations from Google to bring you a smart, secure, and simply amazing experience. Storage: 4GB of RAM, 64GB of storage. Other Functions: 4G Nano SIM, BT, WIFI, Face recognition, Fingerprint, GPS, USB Type-C Connector, etc. YES, A2 has global rom, multi-language. Support GOOGLE PLAY, GMAIL, and you can download Facebook, youtube, etc. 3. What&apos;s the Languages of A2? Support Global Multi-Languages, you can check out the screenshot of picture. * When using two SIM cards, one will support 4G while the other will not. Multilanguage Supported, pls check out the screenshot of the pictures.